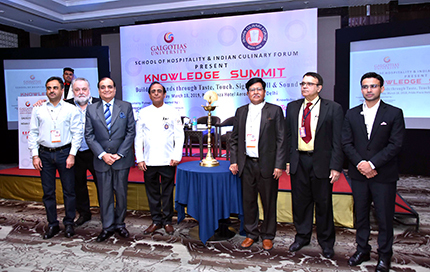 Building brands through taste, touch, sight, smell and sound was the theme of the Knowledge Summit, which took place in New Delhi recently, and was conducted by the Indian Culinary Forum (ICF), in association with Galgotias University School of Hospitality and TagTaste. The event was attended by chefs, sensorial specialists, product tasters, entrepreneurs and industry stalwarts. It was a perfect opportunity for anyone to gain industry insights, understand the nuances of beverage tasting and enhance their professional network. Chef Davinder Kumar, president, ICF, commenced the summit with his welcome remarks. This was followed by the inaugural address and presentation of memento by Onkar Nath Mehra, dean, Galgotias University School of Hospitality, and a keynote address by guest of honour Anil Bhandari, chairman, AB Smart Concepts. Thereafter, the first panel discussion of the day started with the theme, How well is the food industry leveraging the sensory framework? The panel was moderated by Raj Prity Sabharwal, sensory head, TagTaste, and the panellists included Sudhir Tamne, Sumit Nair, Gunjan Goela, Julia Carmen De Sa, Rahul Ganapathy, and Bill Marchetti. They shared insights on how their respective brands were using sensory aspects in their products. For example, the function of papad in Indian food is to bring the crispiness and sound in our eating experience. When Burger King introduced potato chips in one of their burgers to bring the same effect, it became an instant hit. They opined that Indian food culture was immensely interlinked with the sensory aspects. In a way, just the study of our own cultures, traditions, and the wisdom of our mothers and grandmothers could help companies create truly memorable products. People learned the names of all sorts of shapes, colours, and sounds in their childhoods. But, as consumers, when it comes to the way things smell or taste, the only language they ever hear is qualitative — good and bad, yummy and yucky, delicious and disgusting. This is why they find it difficult to put the language to their sensory experiences, such as flavours, even in their adulthood. Therefore, the study of sensory aspects opens a whole new world to not only brands, but also to consumers. Dr Mitali Mukherji, whose research is in the broad area of understanding human genome structure, presented her work on Ayurgenomics - How genetics plays a role in the prakriti of a person, which is instrumental for the application in precision medicine. She shared the history of India’s population migration, and how the genetic code of various individuals makes them immune or prone to certain diseases. She also highlighted how the right diet can balance various anomalies, i.e. doshas, in our prakriti and make us lead a healthy life. This was followed by the second panel discussion of the day and an open house Q&A session of students with successful entrepreneur-chefs of India. The panel comprised Abhijit Saha, Gaurav Wadhwa, Saurabh Agarwal and Sanjay Agarwal and students from Galgotias University, NIFTEM, Jamia Hamdard, Lady Irwin, and many other colleges were part of the session. The discussion opened with an introduction to the changing landscape of the F&B industry in India, and how millennials and Gen-Z were rewriting the rules of engagement with F&B brands. Thereafter, the panel enlightened the students on how to prepare themselves for the industry during their college days, followed by the specific queries from the students. The highlight of this edition of the knowledge summit was the Beverage Sensory Workshop, where Binod Maitin and Jaspal Singh Sabharwal, chief executive officer, TagTaste, shared the nuances of beverage tasting with the audience. Such workshops could help the budding tasters in understanding the art and science behind food and beverage tasting, and the brands to get real-time feedback from the panel of experts. The event was concluded by chef Vivek Saggar proposing a vote of thanks.